If you're looking for a shorter kayak adventure that gives you beautiful views of Auckland City and a history-rich paddle, then this Karaka Bay tour for you. Karaka Bay or Waiarohe ('the bay of shimmering waters') is on the western shore of the Tāmaki River mouth. There is no road access to this Bay and it is this lack of road access which has given Karaka Bay a unique sense of identity; it is unlike anywhere else in Auckland. 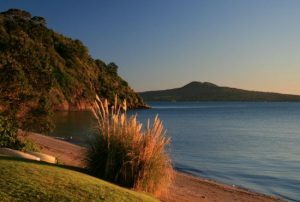 Most importantly, Karaka Bay is a historically significant site where New Zealand’s founding document, the Treaty of Waitangi, was signed in the months following the first signing in February 1840. Chiefs of local iwi and representatives of the Crown signed Māori language versions of the treaty here. There was also a Māori pā (fortified site) here referred to as Ohuirangi, and many historical artefacts such as adzes and evidence of early habitation such as middens have been discovered nearby. Upon arriving at Karaka Bay, your guide prepares a morning or afternoon tea while they discuss the historic heritage of Auckland (Tāmaki Makaurau). All kayak equipment, instruction and refreshments will be provided. Our kayak tours are designed for people with little or no kayak experience. This tour departs on demand only as it does not have regular scheduled departures.